Last Friday, I held my first ever Thanksgiving dinner party. Yes, you got that right. One week prior to – well – Thanksgiving. But although the dinner itself was early, one particular (and critical) thing about it was very last minute: the bird. The actual early bird was me – sitting at a poultry farm a half-hour drive from my kitchen, on Friday morning at 8:00, with 7 hours to go until my guests arrived, having coffee with the farmer’s wife, waiting for the turkey to arrive. It didn’t until 11:00. I realize that in the U.S., planning and preparing for your Thanksgiving dinner is a major undertaking which keeps people busy weeks in advance. I have the fullest respect for and admire all those housewives (female, male, or other) who make the effort of putting up the incredible and infamous Thanksgiving feast with all the luscious sides and supplements themselves. I had 8 people over for dinner, and in order to spare any of us the need to go on a one week relaxation trip after Thanksgiving, and in keeping with another American tradition, we did a potluck with everyone bringing sides (like gorgeous roasted green beans, brussels sprouts or rich sweet potato casserole) or desserts (nutmeg-scented apple cobbler and an outrageous pumpkin cheesecake). I did the turkey, cornbread and italian sausage stuffing (or rather “dressing”, since I didn’t bake it inside the bird), and a pickle. My American friend Donna, who came to Germany 3 years ago, and is co-founder to the new “Danksgiving” tradition at my house, brought a special treat, giving us the real Americana experience of cranberry sauce – straight from a can. I know. I loved it. 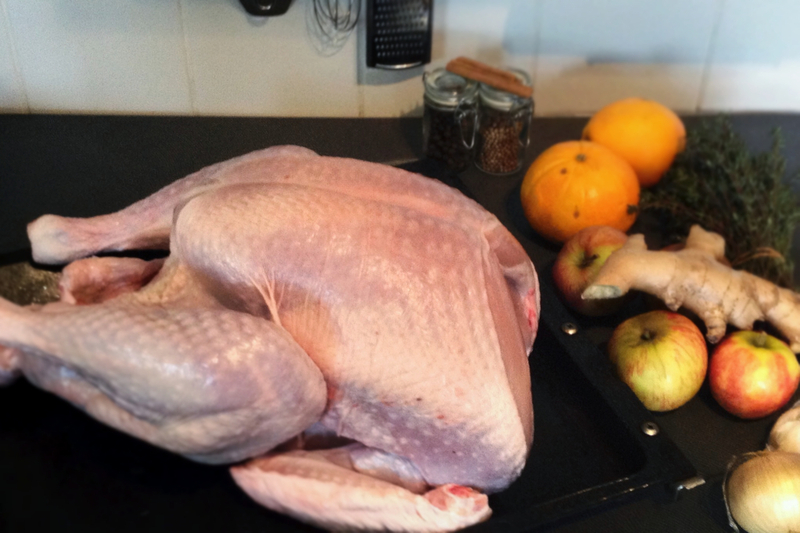 Getting your hands on a whole turkey in Germany around this time of the year is not as simple as you might imagine. Eating a turkey is not a traditional part of the German “Erntedankfest“, the local version of a harvest festival. Turkeys are mostly fattened for christmas. Luckily I live in an area with U.S. Barracks nearby, and I could sneak in with the usual around-Thanksgiving-demand of the local Americans for turkeys. As it was my first whole turkey ever, I had no routine to fall back on. As turkey is not as fat as duck or goose, and has an altogether different meat texture than chicken, I considered a bit of research in order. It quickly turned out that doing the perfect turkey and having the perfect method for preparing it is a bit of a thing in the USA. So when I first read the word “brining” on Thursday, I got a bit nervous. With the turkey not arriving before Friday morning, having it float and decelerate in an aroma bath-isotank on my balcony was (even if an amusing image, I have to say) absolutely out of the question. So with “dry brining” selected as the method of choice (a fancy term for salting your bird thoroughly and letting it sit a few hours before you roast it), roasting times and temperatures were the next puzzle. I mostly cook meat or fish based on intuition and experience, but this time I wanted to be on the safe side. The safest possible method, a low-temperature procedure at – say – 90°C, wasn’t possible. After a bit of reading, I went with a high heat treatment at the start, followed by a longer roasting time at a fairly low heat, monitoring the progress with a roast thermometer (a new addition to my limited collection of kitchen gadgetry). You may have guessed that bird-wise, this is definitely not the kind of post where I (a German guy who did his first ever turkey just a few hours before his guests arrived) will go totally Martha Stewart on you and tell you “hey, this is the perfect way to do a turkey”. But it worked out really well and the meat was juicy and aromatic. And if you should find yourself in a last-minute-Thanksgiving kind of a situation, maybe this does it for you. I found that with this method, the bird does not loose a lot of liquid, so I had to do a bit of last minute witchcraft and conjure up a quick gravy on the spot. Luckily (even if gruesomely), I took the turkey’s neck and head home, too. They made a great base for a dark, aromatic gravy to round up this fantastic feast. Active time: 40 minutes, cooking: about 4.5 hours, resting: >= 30 minutes. 1 If you have it in a cold place, take the turkey to your kitchen and let it sit and come to room temperature a few hours before it is to go into the oven (mine never made it to a cold place after I got it home, obviously). Meanwhile, prepare your dry rub. 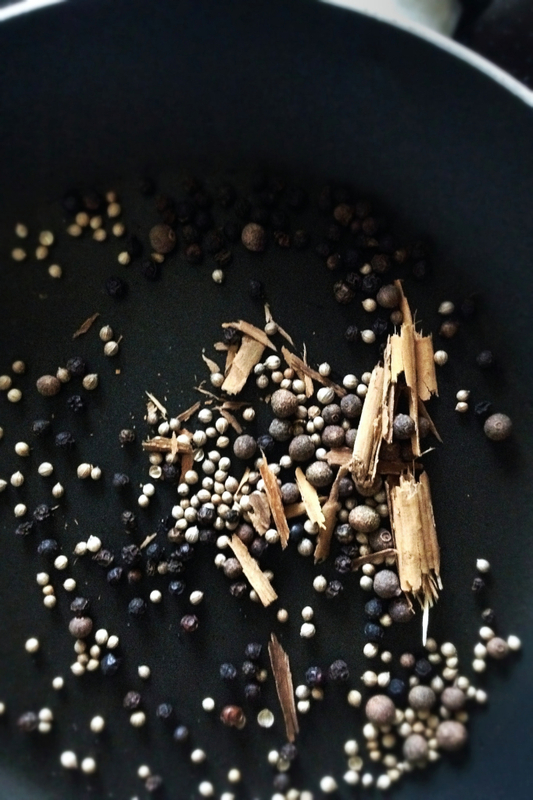 Roast the spices in a dry pan until they start making crackling noises and become fragrant. 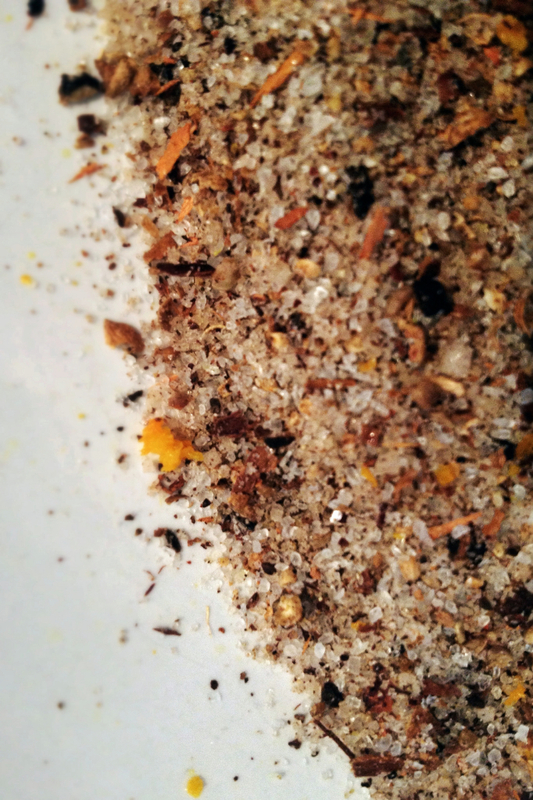 Grind them up to a sandy powder with coarse sea salt, I used a mortar and pestle, but you can easily switch that for some electric grinder. Wash the orange and add the zest to the mix, along with a teaspoon of thyme leaves. If you can, make this mixture in advance and store it in a glass jar. 2 Preheat the oven to 220°C top and bottom heat. Place the turkey on a deep baking tray breast side up and rub it thoroughly with the dry rub. Next, cut up the zested orange, the onions and the apples (pips removed) into 1 inch cubes. 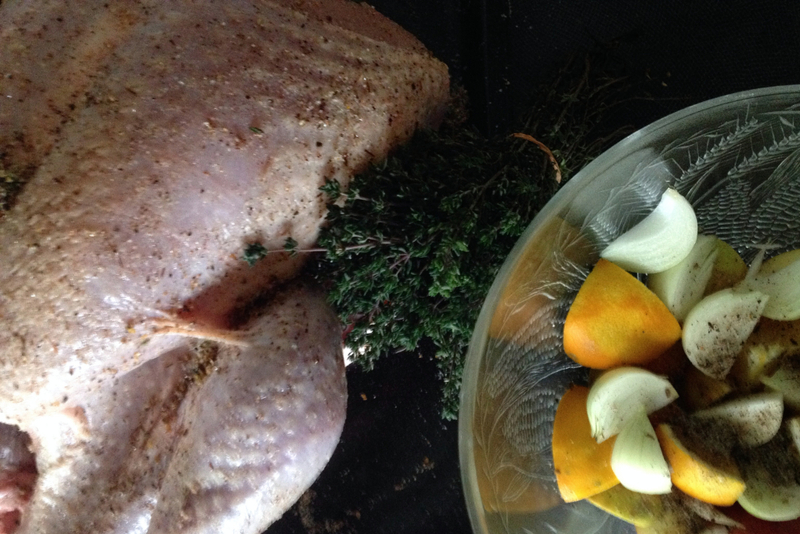 Toss them with the remaining spice mix and thyme sprigs and fill the cavity of the turkey with them. As this is a very loose potpourri kind of stuffing, it lets the turkey roast quicker, while dispensing its delicious aroma through the meat. 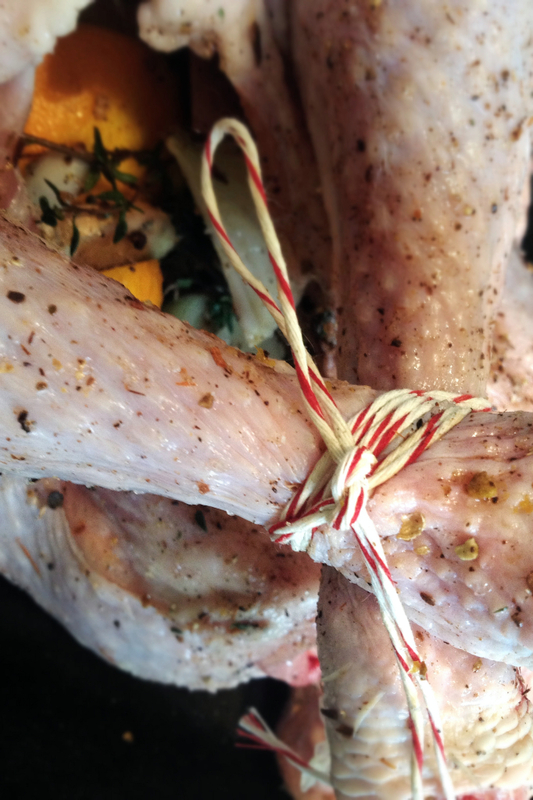 Tie the legs of the bird with kitchen string. 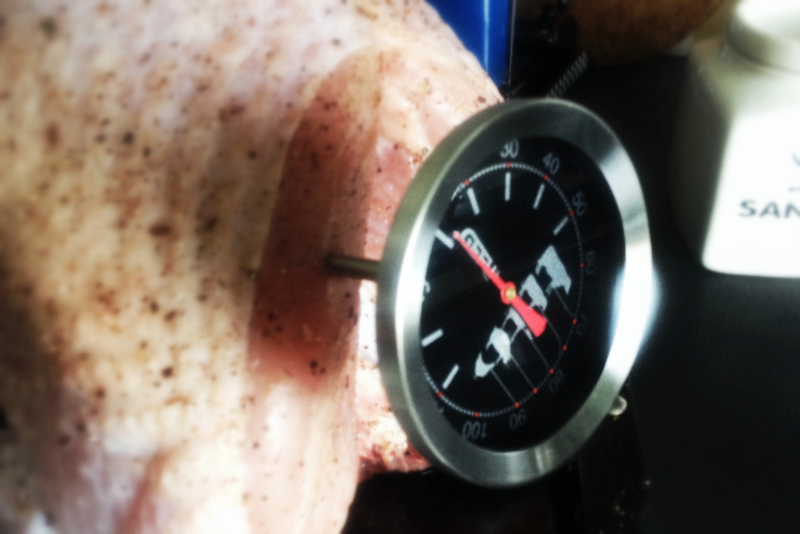 If you have one and want to use it, put the roast thermometer about 5 cm into the thickest part of the breast (or wherever you feel comfortable and right putting it). Pour the chicken stock and Chardonnay around the bird and put the whole setup into the oven (it may be a smart move to check in advance, whether the bird actually fits in the oven). Bake for 20 minutes at 220°C then turn down the heat to 120°C (do not open the oven door to cool it down, just turn it down). From here on, it’s just a question of time. Estimate about 20 more minutes for each pound. Start checking at 2/3 of your calculated time. 3 There are several ways of checking if your bird is done. When your thermometer shows an internal temperature of 75°C it should be just right. You can also pierce into the spot where the thigh meets the body and see if the juices running out are clear (done) or still pinkish (cook it a little longer). When your turkey is done, you want to glaze it and crisp it up. In a small saucepan, melt the maple syrup, butter and salt. Open the oven and pour the mixture over the bird, setting the grill of your oven to the lowest or medium setting. If you do not have a grill option, turn the heat up to 220°C. Let the bird crisp up for about 7 minutes. Watch it carefully, so it doesn’t burn. When the skin is nice and golden brown, take the turkey out of the oven, cover it with aluminum foil and let it rest for at least (!) 30 minutes, so the juices can redistribute. This will make even the breast meat juicy. 4 While the bird is resting, conjure up the sauce. Chop up the turkey neck into 1/2 inch pieces, bones and all. Put on a pan at medium heat and brown the vegetables and the meat in some canola oil (or anything you like). Add salt from the start, this helps break down the fibre structure of the vegetables and helps them soften. When soft, add the roughly chopped garlic clove and keep browning. Push the vegetables to the rim of the pan and roast the tomato concentrate in the middle of the pot until it browns slightly and begins to caramelize. 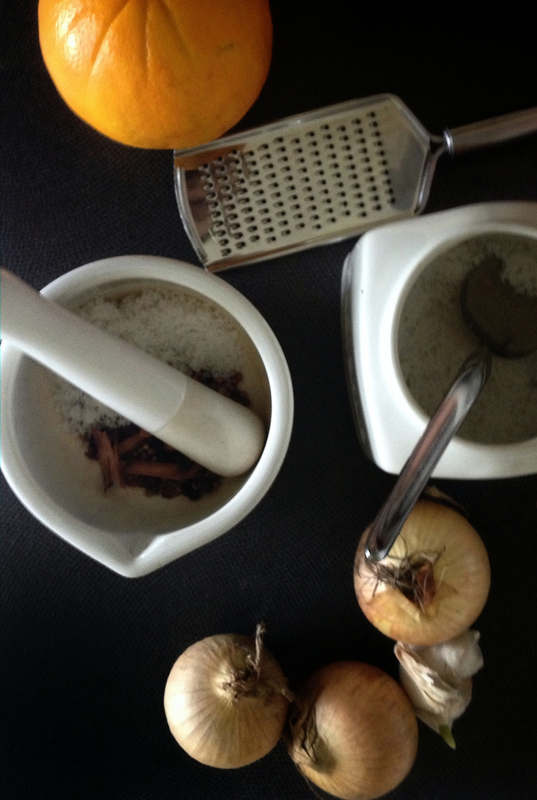 Stir everything together, add the allspice and orange peel and turn up the heat. Add the red vermouth and let the alcohol boil away, as the tomato concentrate, the starch from the vegetables, the gelatin from the bird and the vermouth liquids begin to thicken. Add the wine and season with pepper. Let this cook away until the end of the turkey’s resting time. Add whatever baking liquid is left from the baking tray to the pan and pass everything through a sift. Put the chilled butter cubes into the strained gravy and give the pan a few swirls until the butter has dissolved and gently thickened the gravy.